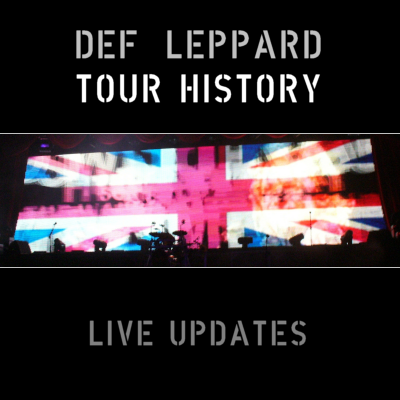 Def Leppard play another show on the 2015 World Tour today in Sendai, Japan and updates will appear live right here. This page will feature updates as and when they happen from this show including the setlist. BLOG ENDED - Show starts at 7pm local time/10am UK. Find out what time it is where you are. 10:19pm (Local Time) - Setlist added here - Sendai 2015 Show Page - more photos being added below. 10:19pm (Local Time) - Until next time - in Sydney - see ya!. All further photo/videos will be added in news updates. 10:10pm (Local Time) - One local fan is sad they have left...at least from what I can make out from the "translation". The train tracks after the band's bullet train departed for Tokyo. 9:25pm (Local Time) - Beatle / Leppard mania in Sendai - at the station just about to get on a bullet train. They didn't waste much time after the show before leaving!. 9:19pm (Local Time) - Sound man and co-producer of 'DEF LEPPARD' - Ronan McHugh. 8:58pm (Local Time) - As you can see in the Hysteria video clip there was 'almost' a mini Thrust stage used - but not quite. 8:48pm (Local Time) - Same setlist as Nagoya. 8:46pm (Local Time) - And the Japanese tour ends. 8:37pm (Local Time) - As some of you may have noticed Phil and Vivian are both using Marshall amps in Japan. Instead of the usual Engl (Viv) and EVH Gear (Phil). 8:29pm (Local Time) - ...or some updates right now!. 8:28pm (Local Time) - This show has been very slow for updates. The crowd is larger than Nagoya which had 1,700 people. This venue holds 2,700+. There could be MANY updates coming soon - not long until it's over. 8:02pm (Local Time) - About 35-40mins left of the show - expect more updates nearer the end and afterwards. 7:50pm (Local Time) - Def Leppard are in a Rock Museum after all - in Sendai. They are also on stage of course!. 7:31pm (Local Time) - Band have now been on stage for 31 mins. 7:13pm (Local Time) - Once again things might be slow during the actual show - will confirm set during or after and add more photos when available. 7:10pm (Local Time) - Presumed setlist so far - will update and confirm the set later on as with the last two shows. Show started at 7pm local time. 7:06pm (Local Time) - As you can see they have seated shows in Japan like North America. 7:04pm (Local Time) - Band now on stage - shown above is a local shrine. 6:40pm (Local Time) - Tonight's show is number 88 in 2015. First photos now coming in. 6:40pm (Local Time) - Hopefully more updates as we near show time. And if not then there will be a setlist and photos soon after. 6:40pm (Local Time) - Local fans will hopefully post updates during the show or afterwards. 6:40pm (Local Time) - Updates LIVE NOW. Expect updates when available and closer to show time.